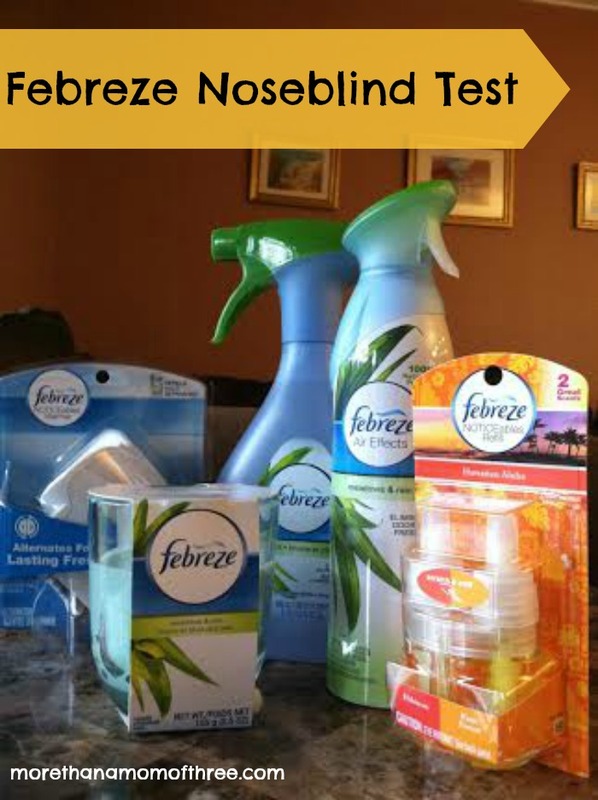 This review and giveaway was made possible by Double Duty Divas and Febreze. I was compensated for my participation in this campaign, but all opinions are 100% mine. More Than A Mom Of Three is not responsible to ship the winner prizes. Did you know that most people are noseblind to the smells in their home? I never really thought about it, but it makes sense. A noseblind is the gradual acclimation to the smells of one’s home, car, or belongings. You live in these spaces so the odors in your home your nose becomes used to them. Guests can pick up on these smells right away since they are not used to it. Whether it is pets, kids or last nights broccoli the lingering smell can hit anyone that is not living there like a ton of bricks. Yesterday was my sisters birthday so we had her family over for a little get together. Perfect for the Febreze Noseblind Test. We popped some popcorn and put on a movie with all the kiddos. During this time I asked them to be part of my little experiment and they happily helped. They then were asked to take a survey on how my home smelled. I have to admit I was a little shocked by what their answers were. They could smell our adorable cat Garfield as they entered my home. I always thought I did a good job of making sure our home never smelled like a cat. I frequently scoop his cat box but I guess the smell still lingers. We have become noseblind to it. After using all of the Febreze products they did say the house smelled fresher but not un-natural. Nothing is worse to me then that high fragrance smell when you use an air freshener or a scented candle. You know that “I am trying to hide an odor in my home let me mask the smell with this hit you in he face fragrance”. I want my home to smell clean and fresh not like a heavy perfume smell. 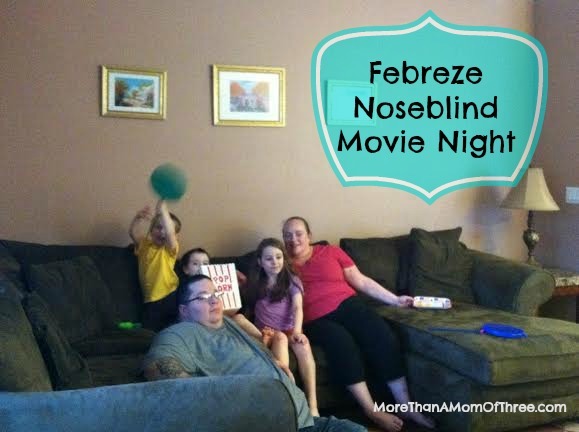 I invite you to grab some friends or family for your own Febreze Noseblind Test! You may be surprised at what you and your family are noseblind to. Show your love for Febreze on Twitter and Facebook to get the latest information and promotions. 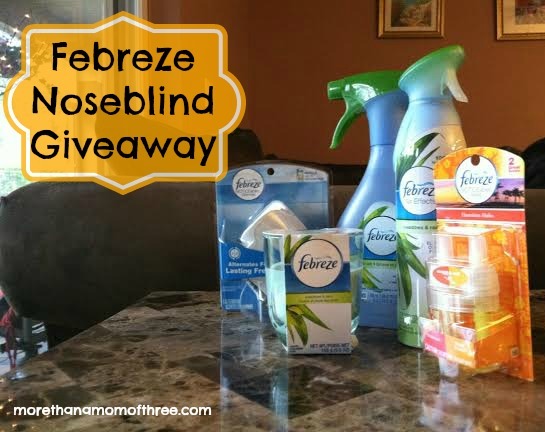 How about a Febreze giveaway? Entry is simple, just follow the instructions on the Rafflecopter. I think I am noseblind to our dirty laundry basket. It’s neverending! I think I just got used to it. I am nose blind eo the greasy food smell. Our two cat litter boxes. I would like to be rid id the greasy coo;ing smell. More than likely the three dogs have me Noseblind. I am noseblind to my 2 cats and the litter box. Cooking smells linger long after the meal is gone. I’m NoseBlind To Pet Odors In My Home. I think I am noseblind to dog odors in the house. I’ve become noseblind to cooking odors. I am probly nose blind to my pets odors on my carpet and on my furniture. I’m noseblind to the dog. I am noseblind to pet and food odors. I am noseblind to my dogs smell. I am noseblind to my dog and cat!! I’m noseblind to litter box odors! I think I am noseblind to the smell of the dishes in the sink. probably dog pee because my dog is getting so old and losing control of her bladder which is grossing us all out! I am probably noseblind to cooking odors that linger in the house. I am noseblind to cooking smells. I’m noseblind to dog smells. I’d have to say it’s my hamster’s natural smell. Other people smell as soon as they walk in, but I just can’t! I am noseblind to food and cooking odors in my home. I am noseblind to my dog for sure. I’m noseblind to refrigerator odors. To the wet and dirty diapers! I know I am noseblind to pet odors in my house! I am blind to food smells. I would have to say my garbage. I am nosebind to pet ordors I am sure. We have three furbabies so we are pretty immune or noseblind to their smells! Noseblind to the smell of food I cook! I am always self conscious to the smells of my room, and I am too clumsy to have candles. Also, I am noseblind to my cats. Sometimes I’m noseblind to my refrigerator. When it happens, I smell it at first then I don’t smell it anymore and think it was just my imagination. I only notice it again when I come home from somewhere else and then I have to clean it out. I get Noseblind to my cigarette smoke that comes in from the patio. I need to freshen my drapes with some Febreze. I might be noseblind to our 2 dogs. Yikes. I think I’m noseblind to pet odors in our house. Thank you for the wonderful giveaway. I am #noseblind for food smells when I cook at home, Thank you! The smell of my pups. Actually, the rabbit… she has more scents that come along with her. I can smell it when I’m near her cedar stuff, but not after I’ve been in there a bit. She hops around and has no smell, though. Odors from my cats. Though I didn’t notice any smells after going away for 4 days, so it must not be bad. I know I am noseblind to my 3 cats, I’m sure parts of the house smell like their hair or their litter box. I think I’m noseblind to our new kitten. I would say our dog. I think the only thing that is funky in the house is the laundry room. I am nose blind to pet odors. I am definitely nose blind to the pet smells in our home. I think we are probably noseblind to the litter boxes in our house. I think I am noseblind to the smell of our 3 pets. Indoor pets. My girls have indoor small pets in our living room in addition to two dogs and I worry about if I can’t smell them. I am sure they stink, and I worry about what other people smell. Thank you for the wonderful giveaway! I think I’m nose blind to my hubby’s smelly, sweaty work clothes! Pet odors and wood smoke in the winter. With 2 dogs and 5 cats I would say that the house smells of pet odor. I know I’m nose-blind to my pet odors due to our Boxer and Hedgehog. I am noseblind to my dogs odors in my home. I am noseblind to the musty smell in my home. We had some loose duct work under the air vent in the living room and, even though it’s been repaired the musty odor still lingers. I can smell it when I go out for awhile and come home and open the door. I think I am noseblind to the scents of my 2 dogs. I have two cats and I’m #noseblind to the cat litter smell from my house! I’m most likely noseblind to smells from the cats! I am probably noseblind to our diaper genie. my cats and my rabbit – I’m not sure if that’s a blessing or a curse! i think i am noseblind to cat box odor. The damp smell from our basement. Noseblind to cooking odors that linger — like onions. I am probably nose blind to the smell if my dog! I am Nose blind to my 2 cats.